EXPERIENCE TROPICAL PARADISE! From the large wrap-around lanai you have magnificent unobstructed views where you will enjoy spectacular sunsets year round, watch spouting whales in winter and playful dolphin all year. Our ground floor corner unit, which is just steps from the ocean, is considered to be the best location at the Surf and Racquet; it is very private. We manage our condo as this is our "home away from home"
The spacious living and dining areas open onto the large lanai where you'll enjoy outside dining and memorable panoramic coastal views and unforgettable sunsets. 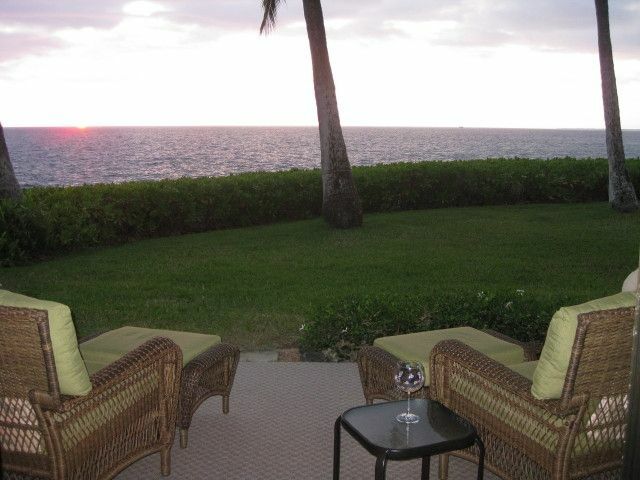 From the lanai you step onto a lush lawn with the ocean just feet away. The master bedroom has a king-size bed overlooking the ocean. The guest bedroom has two twin beds. The well equipped kitchen also boasts an oceanview. There is secured high speed WIRELESS internet service for your laptop. Your assigned parking space is steps from the front door ... no lugging heavy baggage and groceries any distance or up stairs. This is a NON-SMOKING unit and NO pets allowed. The prestigious GATED Oceanfront Keauhou-Kona Surf and Racquet Club is located in a garden setting on 17 acres surrounded by the Pacific Ocean and the world-class Kona Country Club Golf Course. There are three lighted tennis courts (no charge), swimming pool, picnic area, gas and charcoal grills. You are within walking distance of shopping, restaurants, multi-plex movie theater, and Kahalu'u Beach, for the best snorkeling on the Island. We have always loved the Big Island as Alex was born and raised on the Hilo side of the island. We were fortunate being able to purchase our condo once being retired so we could spend as much time as possible in our "home away from home." We manage our condo so please call us with any questions you may have. We know the island fairly well and have stayed in many resorts and Keauhou Kona Surf and Racquet Club is by far the very best. Being ground floor just steps from the ocean with a magnificent view is unbeatable.